Halfway There: Who's your papa? 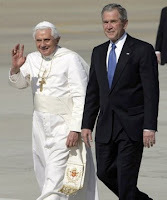 The Eternal Word Television Network is knocking itself out with coverage of Pope Benedict's visit to the United States. And why not? Benedict XVI is the chief executive, prophet-in-residence, and officially infallible official of the religion EWTN was organized to promote. It's quite an event when the man at the top of your hierarchical pyramid comes calling. On his birthday, too! I heard some snippets of EWTN's coverage of the papal visit. The commentators alternated between gushing accounts of Benedict's progression through his itinerary and pettish whining over the insufficiently deferential coverage in the secular media. (If only the CNN reporters would kneel, bow their heads, and beat their chests as they extolled the virtues of Benny Hex.) One EWTN talking head especially decried the mass media's insistence on referring to recent Church scandals and reporting about dissidence within Catholic ranks. Said this commentator (as best as I can recall), “I wish they would stop talking about divisions in the Church. There are no divisions. There are observant Catholics and non-observant Catholics.” It's very impolite of the secular media to take dissident Catholics seriously (especially when such Catholics are mean enough to deny their weekly contributions to criminal enterprises like the Boston diocese until the inaptly named Cardinal Law was driven out of town). The pope is a symbol of Church unity. To object to the pope's policies is deny one's duty to submit to his leadership. There is, nevertheless, a great deal of casual dissidence among American Catholics, most of whom confine their rebellion to keeping their fingers crossed while popping contraceptives. More militant dissidents can sometimes be found carrying pickets in front of cathedrals and agitating for the ordination of women and other unlikely reforms. But they're pikers. The real dissidents have their own pope. Or popes. The business of rival popes—or “antipopes”—has been in the doldrums a long time. The Catholic Church itself seldom bothers to list any antipopes after Felix V, who contended with Rome in the fifteenth century. Nevertheless, there are some fascinating characters around today who insist that they—and not Joseph Ratzinger—are the authentic pope of the Roman Catholic Church. If you don't fancy Benedict XVI, you could always pledge your allegiance one of these fascinating schismatics: popes in America! Perhaps the most conventional of today's antipopes is Lucian Pulvermacher, a harmless old man whose followers style themselves as the True Catholic Church. The Roman church, in their view, went off the rails when John XXIII convened Vatican II. 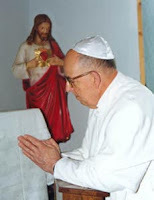 Pulvermacher's congregation regard him as the true vicar of Christ, faithful to the traditions supposedly abandoned by the Romish popes (who are therefore disqualified from office and not true popes at all). After staging a papal election in Montana (in which he was the only candidate), Pulvermacher adopted the name Pius XIII, making explicit his claim of being the successor of Pius XII, whom he regards as the last legitimate pope. Pulvermacher is reportedly living quietly and out of the public eye in Washington State. His followers are few in number and it's unlikely that Benedict XVI loses much sleep over the activities of his obscure rival. If Pulvermacher is not your cup of schismatic tea, then perhaps David Bawden has that necessary extra bit of amusing eccentricity. Bawden lives in Kansas and was elected pope with the assistance of his parents and a few friends. His wackiness has attracted more media attention than Pulvermacher's low-key antipapacy. Bawden uses the papal name Michael I and doesn't fret unduly over his lack of holy orders. While Pulvermacher is at least a renegade priest, Bawden has never been authorized to celebrate the Catholic mass. He missed out on ordination when he was dismissed from a seminary. One might think this would handicap someone who aspires to the papacy, but nothing daunts David Bawden. He presides from a throne in his parents' thrift shop. Michael I generated some excitement in 2006 when he hinted that he might move from Kansas to relocate near some of his devotees in Colorado. That all came to naught when it was decided that it would be better for the antipope's followers in Colorado to move to Kansas instead. Unfortunately for the Colorado schismatics, they have been unable to sell their homes despite efforts on their behalf by their preferred pope. In flogging one of the properties, Bawden unselfconsciously wrote “This is where Pope Michael stays, when he is in Colorado. This is a fine family with young boys.” But still no sale. Don't forget the sedevacantists, who hold that the Holy See has been empty since Pius XII died (fifty years this October!). I mean, Pulvermacher may lead a group of self-proclaimed Catholics, but if he's not in Rome he's not the Bishop of Rome! He can hardly be the Primate of Italy (though that one sounds suspiciously Darwinist). He's neither the Archbishop and Metropolitan of the Roman Province, nor is he the Sovereign of State of the Vatican City. I don't understand why someone doesn't declare themselves the Pope of the Church of the Flying Spaghetti Monster. At least there wouldn't be any competition. "Benny Hex" -- love it!